At time when iphone and mobile are the popular means of surfing and browsing internet, Google seems to be catching with this trend by offering ‘Device Platform’ option for desktop & laptop and for iphone or mobile in AdWords. 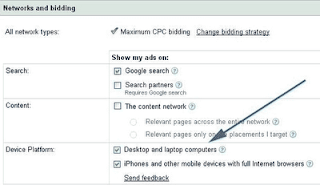 One of the AdWords account holders, as reported by a search engine watch forums, has got such option. Below is the screenshot for the same. I have inquired with some of my colleagues if they have got such option of ‘Device Platform’ in their AdWords account; I have got mixed replies. However, I personally don’t see this option in my clients’ account yet many others do. This means that Google team is making this option available for a few, as of now, depending on their business models. Currently, this appears to be in BETA but soon we’ll have this option to gain more control over our advt. A sweet gift for advertisers by Google on Thanksgiving Day!